Child-friendly? "The Karate Kid" is a remake of the 1984 film of the same name. It deals with a young boy named Dre who travels with his mom to China and winds up being an outcast. After he is attacked by a group of bullies, Dre meets an experienced martial arts master who trains him in the art of kung fu. Kids of all ages will love the action, but parents should know there’s a scene where the two main characters, who are 12 years old, share a kiss. The film is recommended for ages eight and up. Sixteen years, two sequels and a billion pop culture references after Ralph Macchio and Pat Morita kicked their way into the hearts of millions in "The Karate Kid," the story of an underdog who excels at martial arts is back on the big screen. Wait a minute, though. This time, it’s not karate – it’s kung fu. And the lead whippersnapper isn’t a teenager – he’s 12. And, hey – if we’re getting technical here – you know the scene where Mr Miyagi captures a fly with a pair of chopsticks? It’s a swatter this time around, and the little bugger is flattened like a pancake. And yet, surprisingly, all is not lost on Hollywood’s latest remake endeavor. The story begins as Sherry Parker (Taraji P. Henson) moves her son, Dre (Will Smith’s adorable tot, Jaden Smith) from Detroit to Beijing because of a new job. Lost in a new land and overwhelmed with his surroundings, the doe-eyed darling soon becomes an outcast. Cue the bullies from stage right. After Dre impresses the lovely tween Meiying (Wenwen Han), a group of kung fu-practicing punks try to beat him to a pulp. Luckily, the pipsqueak is rescued by Mr Han (Jackie Chan), a martial arts genius-turned-janitor, who agrees to train him for an upcoming competition. Of course, you know the rest. 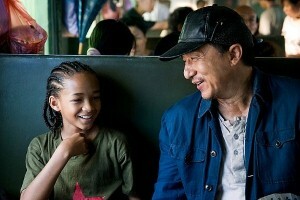 More action-packed than the original yet less emotionally-intense, the new "Karate Kid" may be an even better film for parents and children to spend an afternoon together. Kids of all ages will adore the kung fu, although – be forewarned – the little ones may not appreciate Dre and Meiying’s quick kiss. But let’s not fool ourselves – something is missing here. The truth is, Dre could have waxed on and off until the cows came home and the movie still would be missing some serious heart.